For a guy who is 2-8 over his last 10 fights — getting finished six times along the way — you would expect maybe a softer approach when assessing what went wrong. 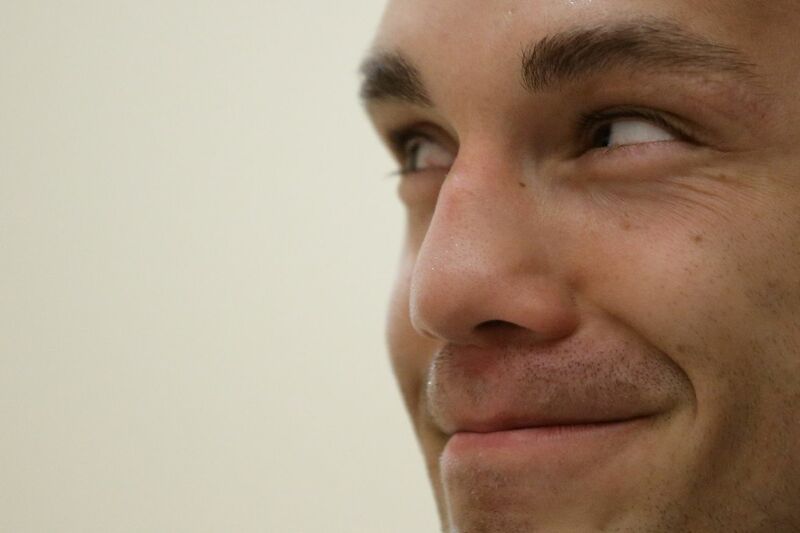 Instead, Jake Ellenberger simply s—t all over his last opponent because it probably makes him feel better about losing. The fighter in question is Ben Saunders, The Ultimate Fighter (TUF) 6 grad who also made a name for himself in Bellator MMA. I guess the idea of losing to “Killa B” at UFC Utica by way of knockout is too much for “The Juggernaut” to process, judging by his comments to Submission Radio. “It is what it is” is the new GOT CAUGHT. Ellenberger (31-14) will have the opportunity to snap his three-fight losing streak when he battles the venerable Bryan Barberena at the upcoming UFC Fight Night 135 event on FOX Sports 1, scheduled for Aug. 25, 2018 inside Pinnacle Bank Arena in Lincoln, Nebraska. A loss could mean the inevitable pink slip. As for Saunders (22-9-2), he looks to build on his “Juggernaut” win by taking on dangerous Brazilian bruiser Sergio Moraes at the pending UFC Fight Night 137 fight card next month inside Ibirapuera Gymnasium in Sao Paulo, Brazil, also on FOX Sports 1. For even more upcoming UFC events click here. Stipe Miocic has the most credible case of anyone as the best UFC heavyweight of all time, yet the man remains his quiet, unassuming, underrated self. It’s the underrated part that has gotten just a little bit under his cold-bitten Cleveland skin in the past, particularly in how that under-rating was reflected in his paychecks. He was out-earned by Alastair Overeem defending the belt in his hometown- a fight he won by first-round TKO, shutting off Overeem’s motherboard with terrifying ground strikes. His next fight, after not getting the pay raise he wanted, he was also the underhyped, the focus being on fearsome Cameroonian man-mountain Francis Ngannou. Ngannou had Stipe by twenty pounds or so, but Stipe had him by twenty minutes of cardio, pushing through his own exhaustion to grind the African into inert survival on the mat. He did all this while holding down his day job as a fireman and EMT, and starting a family to boot. 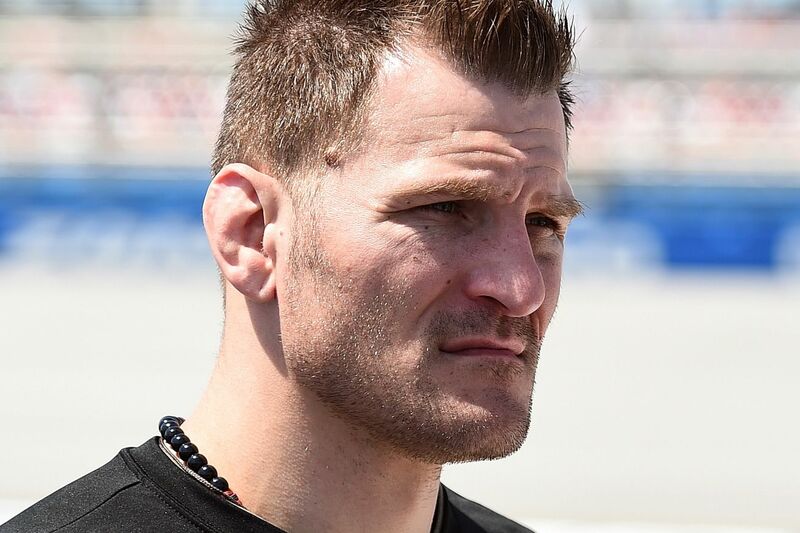 Miocic blames the sale and subsequent ownership transition of the company for past slights, saying in his hoarse but happy growl that he basically got neglected in the shuffle. UFC 226 is this Saturday. Don’t miss it. Sometimes Joe Rogan has a good take, and his Suga Sean O’Malley shirt is very cool. Real life application to martial arts technique here. Gritty stuff. Congratulations to everyone (even Joben) who sponsored MMA Mania’s own pro fighter, Alpha Male’s Andrew Richardson. This remarkable article about Russian soccer hooligans who train combat sports to fight each other in the woods will be of great interest to you. Russia is crazy country. If you haven’t taken the time to watch it yet, catch the whole documentary about our own analyst Andrew Richardson’s pro debut. If Conor McGregor is to be believed, the purse estimates thrown out by Dana White for a Floyd Mayweather vs. McGregor mega-fight were a tad conservative. White predicted Wednesday on The Herd that McGregor could earn $ 75 million for the potential blockbuster bout while Mayweather could $ 100 million, depending on pay-per-view sales. The figures were the first major indication of the financial implications of a Mayweather-McGregor contest from the UFC President since the bout shifted from a pipe dream to an actual possibility, but according to McGregor, White was actually underselling things a bit. White said Wednesday that he expected to finish negotiations with McGregor on the fight “in the next couple of days.” He then planned to sit down with longtime Mayweather partner Al Haymon to hammer out the details with Team Mayweather. Much is left to figure out regarding the potential contest, including a date and venue, but White conceded that it would be a boxing match under boxing rules with boxing officials, as expected. Considering that McGregor and Mayweather are the two highest earners in the history of their respective sports, it’s possible that the unlikely pairing could result in one of the biggest spectacles ever seen in combat sports, though that remains to be seen. McGregor, 28, is currently the UFC lightweight champion. In 2016, he became the only simultaneous two-division champion in UFC history while headlining three of the five highest-selling pay-per-views ever staged in mixed martial arts. Mayweather, 40, is a formerly retired prizefighter who is considered one of the greatest defensive fighters of his era. The 49-0 boxer holds the all-time pay-per-view record for his 2015 contest against Manny Pacquiao, which sold an estimated 4.6 million buys. UFC featherweight and lightweight champion Conor McGregor recently called out Floyd Mayweather Jr. for a boxing match, and UFC President Dana White backed McGregor up. These days, any time Conor McGregor is in the news, Floyd Mayweather Jr.’s name ends up not being far behind. On Saturday, Conor McGregor knocked out Eddie Alvarez to claim his second UFC championship. It was a historic feat that stirred up questions about what would be next for the two division champion; it also sparked a war of words with the former pound-for-pound boxing king. When Mayweather was asked his opinion on McGregor, he dismissed the Irish superstar as merely “piggybacking” off the Mayweather name, comparing McGregor to an ant and himself to an elephant. McGregor responded by saying Mayweather could “say it to my face.” Then, Tuesday night, per TMZ, McGregor took over a DJ booth at a nightclub in New York City and took another shot at “Money” Mayweather. “Floyd’s not ready for this. Much respect to Floyd. He’s a solid businessman. What he’s been able to do, he’s a f*cking animal at what he’s been able to do. [But] as far as real fighting – true, pure unarmed combat – Floyd don’t want none of this. He does not want none of this. He wants it under boxing rules. He wants a boxing match. He doesn’t want a fight. But though the jabs might be retreads, not everything is the same. When the rumors of a possible Mayweather-McGregor fight first started popping up, UFC President Dana White was very complimentary of Mayweather, saying he was open to the possibility but that Mayweather had to contact him about it. Now, it appears White has changed his tune. It’s possible that White has lost his respectful tone because Floyd seems to be happy in retirement, telling USA Today that he is content with his retirement. Then again, Mayweather was the one who first postulated a fight between himself and McGregor as something different and interesting enough to get him to leave his retirement in the first place. So who knows, maybe this time it’ll actually stick. After all, as Mayweather has been known to say, “if it makes dollars, it makes sense” and there are few things in combat sports that would make more dollars than this fight. Keeping him down. Nate Diaz says the UFC wanted to keep him out of Madison Square Garden for UFC 205. +175. Oddsmakers set Nate Diaz as the most likely next opponent for Conor McGregor. Garbage. Lyoto Machida suspended for 18 months for anti-doping violation. Battery. Roy Nelson suspended for nine months for kicking Big John McCarthy. Market. Ryan Bader explains why he decided to not renew his UFC contract and test free agency. The Flying Knee MMA. The Naked Gamblerman gives a brief history of how dope flying knees are. This is a great series and you should check it out. Khabib talking to MJ is harsh and beautiful. Some more of that main stream coverage. GSP answers some fan questions. Full TMZ interview with Mayweather. Best guess, they do Khabib-Ferguson for interim belt while Conor takes time off. Could be a fun build up here. Jones has been active on Twitter last couple days. 5 third-round finishes is pretty nutty honestly. It’ll happen one day I’m sure. Philipe Lins (10-1) vs. Kleber Silva (12-7, 1 NC); Bellator 168, December 10. Dong Hyun Kim (21-3-1, 1 NC) vs. Tarec Saffiedine (16-5); UFC 207, December 30. 2000: Randy Couture won the UFC heavyweight championship for the second time when he defeated Kevin Randlemanat UFC 28. This was the first UFC event held under the Unified Rules of Mixed Martial Arts and had the only ever UFC superheavyweight bout with Josh Barnett stopping Gan McGee. This night was also the UFC debut of Barnett and Andrei Arlovski. 2007: The UFC held its 100th event, UFC 78 which was headlined by a light heavyweight bout between Rashad Evansand Michael Bisping; it was the final light heavyweight bout of Bisping’s career. This night was also when Houston Alexander stopped being for real as he was manhandled by Thiago Silva. 2012: Georges St-Pierre won unified the welterweight title belts by defeating Carlos Condit via unanimous decision at UFC 154. Even Luke Thomas says this thing could maybe actually happen. I never thought I’d see the day. Let Conor go chase after Floyd/take time off for his family. Have him drop the belts and promote Aldo to featherweight champion. He fights the winner of Holloway-Pettis. Khabib and Ferguson fight for the lightweight strap. All the divisions are suddenly back in full swing and everyone is happy. Foolproof plan. And that’s all folks. Have a great one and see you tomorrow. If you find something you’d like to see in the Morning Report, just hit me up on Twitter @JedKMeshew and let me know about it. Also follow MMAFighting on Instagram and add us on Snapchat at MMA-Fighting because we post dope things and you should enjoy them. Apropos of nothing, would the Miesha Tate that showed up at UFC 205 beat the Joanna Jedrzejczyk of UFC 205? Back in July, when Chael Sonnen first announced he was mulling a return to mixed martial arts, he noted that his comeback plans depending entirely on his dealings with USADA, the UFC’s anti-doping partner who ultimately tested Sonnen four times out-of-competition. As long as those tests came back clean, Sonnen reasoned that there would be a good chance he returned to competition in the UFC. As it turns out, Sonnen was telling the truth — or at least partly. Sonnen did indeed end up returning to the fight game, only on a multi-year contract with Bellator MMA, rather than the UFC. And according to Sonnen, the UFC’s ongoing relationship with USADA ultimately had zero bearing on his decision. 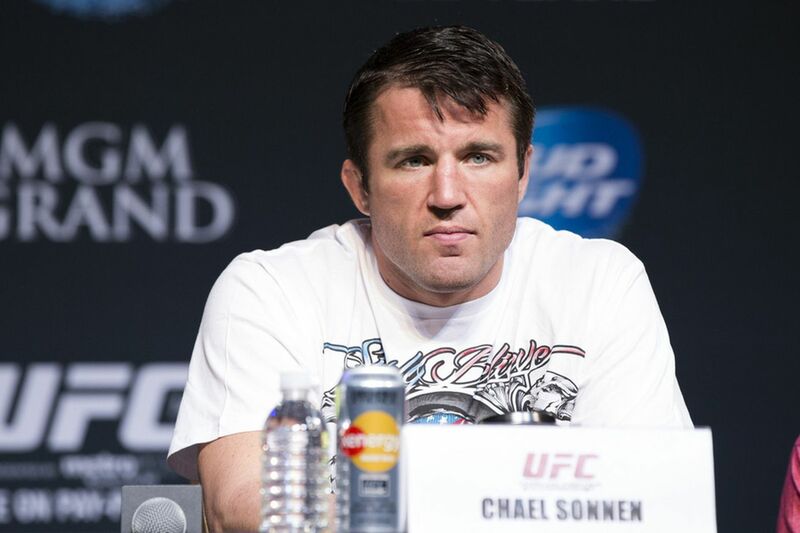 “It didn’t have anything to do with it,” Sonnen told MMA Fighting on a Friday conference call. “Now if I would’ve gotten flagged by USADA, (Bellator president Scott) Coker’s not talking to me either. And I get it, I would be toxic. I don’t like those things I did. They embarrass me. I steer into it sometimes with the ‘basically (clean)’ and all of that kind of stuff. The truth is, man, that stuff embarrasses me. It was a different world with different times. Sonnen, 39, infamously tested positive for performance enhancing drugs in two out-of-competition tests ahead of his scheduled UFC 175 fight against Wanderlei Silva in 2014. The testing failures resulted in Sonnen receiving a two-year suspension from the Nevada Athletic Commission — a suspension which expired in July. Sonnen was also an admitted user of testosterone replacement therapy before the controversial practice was banned by the NAC in early 2014. While it is no secret that the drug testing protocol in Bellator is substantially less stringent than that of the UFC — Bellator still relies on commission-mandated testing, while the UFC uses USADA as a year-round third-party overseer — Sonnen indicated that he not only passed all four of his USADA tests, but also that Bellator included special provisions in his new contract that are designed to punish him if he slips back into his old ways. “If I was to fail a test under my Bellator contract, it would cost me 100 percent of my purse and $ 500,000. That is in writing,” Sonnen said. “Now, I understand for you guys, that’s not as good as a clean test, but boy, that’s got to mean something. If you think I didn’t read that part of it before I signed it, I did. When asked about Sonnen’s claim, Bellator president Scott Coker declined to discuss specifics of the former UFC contender’s contract. Sonnen went on to reiterate that while he occasionally makes light of his past wrongdoings, he remains deeply ashamed of the situation. “Some guys, they use some of those things and they go, ‘well, it didn’t enhance me, it helped with recovery.’ It did with me. I got an enhancement,” Sonnen said. “I felt better, period. I needed less sleep at night, I had more energy. The recovery thing, that’s true too. It was absolutely an enhancement. I get asked that by people, ‘hey, did you ever take anything that was an enhancer?’ I never took anything that wasn’t an enhancer. That’s the only reason I would take something, if I thought it would enhance me. Bellator has yet to set a date for Sonnen’s promotional debut, but for now “The American Gangster” is hoping for a November meeting against UFC Hall of Famer Tito Ortiz at 205 pounds. Sonnen is also angling for that fight to take place in California — a state which, under the direction of commissioner Andy Foster, is currently one of the leaders in the push for increased regulation. Nonetheless, when asked if Bellator plans to implement a year-round drug testing policy in the future, Coker only demurred, reiterating that the promotion will continue with its current strategy while also singing the praises of Foster. LAS VEGAS – Kelvin Gastelum talks about his decision win over Johny Hendricks at UFC 200, the welterweight title picture, wanting to fight Tyron Woodley, and much more. Joe Rogan has been a major cog of the UFC machine since 1997, when he first joined the fledgling promotion as a backstage interviewer. He eventually made his way into the color commentary booth, and it is there he’s stayed for almost two decades, working alongside play-by-play man Mike Goldberg to call nearly every major moment in the UFC’s young history. But there is a chance Rogan’s run with the UFC comes to an end this summer. The 48-year-old’s broadcasting deal is slated to expire shortly after UFC 201, and Rogan admitted on Monday that he still isn’t sure if he is going to return to the UFC on a new deal. There is one significant factor in play that could sway Rogan’s decision. Reports emerged earlier this month that UFC executives Lorenzo and Frank Fertitta are in heavy discussions to sell the UFC to a variety of suitors for a price tag ranging anywhere from $ 3.5 billion all the way to $ 4 billion. Chinese developer The Dalian Wanda Group is the front-runner and a sale could be announced as soon as July, sources recently told MMA Fighting’s Ariel Helwani. For his part, Rogan said there is a “100-percent” chance he will leave the UFC in August if the Fertitta brothers decide to sell — though Rogan also added that he has been given no indication if a sale is imminent. LOS ANGELES — Count Daniel Cormier among those who feel the Nevada Athletic Commission vastly overreached by handing Nick Diaz a five-year suspension earlier this month. 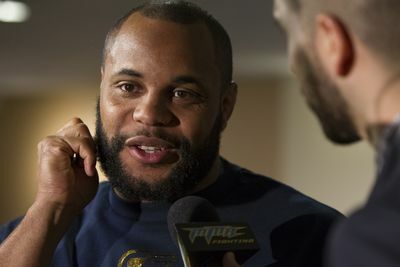 “It’s wrong, it’s 100 percent wrong and I hope it’s overturned,” Cormier told MMAFighting.com on Monday. Like so many others, Cormier compares Diaz’s marijuana-related suspension to less severe penalties the NAC has handed out for far more serious infractions and feels something doesn’t add up. Cormier, however won’t go so far as to boycott Las Vegas as a fight location. And that’s taking into account the fact he has his own beef with the commission: They didn’t even know his name when he showed up last year for his hearing regarding his hotel lobby brawl with Jon Jones at the MGM Grand. Ultimately, Cormier said that same traits which fellow fighters admire in Diaz are the reasons he ran afoul of the commission. Even if Anderson Silva left things a little up in the air regarding his future after Saturday nights victory over Nick Diaz, his longtime friend and manager Ed Soares doesn’t think we’ve seen the last of the consensus greatest of all time. Soares appeared on Monday’s edition of The MMA Hour, and said that not only does he believe the 39-year-old Silva will fight again, but that he’ll fight again at some point in 2015. After spending the last 13 months rehabilitating a broken leg and getting back into fight shape, Silva made a triumphant return to the Octagon at UFC 183 in Las Vegas, scoring a unanimous decision over Nick Diaz. Afterwards, an emotional Silva said that his family had pleaded with him to stop fighting, though he didn’t elaborate on whether or not this might be his swan song. 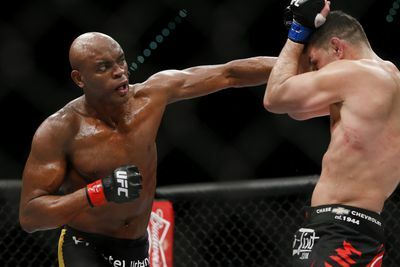 In the aftermath, many fans and media opined that this was a chance for Silva to go out with a victory, having now put away the bad memories of the broken leg he suffered in his title rematch with Chris Weidman at UFC 168. Soares isn’t one of them. And, with the Diaz fight having been novelty of sorts — Diaz returned from a semi-retirement and moving up a weight class from his usual welterweight — he believes there’s a bigger “superfight” that can be made. “I think that GSP fight would be an incredible fight,” he said, referring to longtime welterweight champion Georges St-Pierre. “I definitely think that that would be the fight where if I could be the ultimate matchmaker and say, which fight would I like to see, I’d like to see GSP vs. Anderson Silva. I think as they’re going towards the tail end of their careers, they’re two of the greatest that have ever stepped foot in the Octagon, and neither one of them has a title right now, so this would pretty much be the superfight. While both held titles, the UFC had long talked about doing a St-Pierre-Silva superfight. Silva even showed up to UFC 154 in Montreal and sat cageside when St-Pierre defended his title against Carlos Condit. Yet, St-Pierre was reluctant to mess around with jumping weight classes at the time, and ultimately ceded his belt for a “break” after defeating Johny Hendricks at UFC 167. St-Pierre, now 33, remains inactive in early 2015, though UFC president Dana White is confident he’ll come back to fight again at some point. After rewriting the record books for title defenses, Silva lost his belt to Weidman at UFC 162. With neither St-Pierre or Silva holding up their respective weight classes as titleholders, Soares thinks the timing is right to make the fight — though he’s not sure what the odds are of it actually materializing. “I have no idea what the chances are, I mean, that’s a question for Dana, and maybe that’s a question you’d have to ask George St-Pierre,” he said. “I know that Anderson has all the respect in the world for Georges St-Pierre, but I know that that’s a fight that from a fan’s perspective and from a business perspective, it’s a fight that makes sense for everyone involved. Asked if he would pitch the fight to the UFC for when Silva was done filming TUF and ready to go, Soares said that probably wouldn’t be necessary.